When I think of bourbon I think of brown sugar, vanilla, and caramel with maybe some spice and wood thrown in. Of course, bourbons can range widely from this taste profile, but this is what my mind will naturally return to when the topic of bourbon arises. 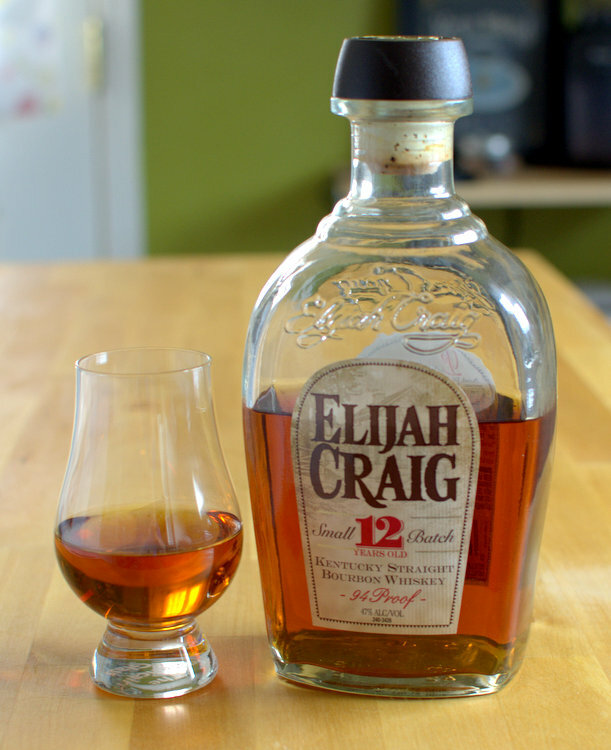 The Elijah Craig 12 has got to be one of the more "bourbony" bourbons around. It's loaded with all the flavors which make bourbon good. Palate: The nose follows through with the flavor. Lots of brown sugar, vanilla, and toffee. Almost syrupy mouthfeel, but not too much so. Behind the immediate bourbon-ness there is some spice -- wood and a little floral. Finish: Medium-long, caramel, sweet. There's something else at the end; I can't decide if it's a nice woody flavor, or a little bit bitter. For my own sake I'll just decide that it's woody and like it more. Overall: 7.5 out of 10. Hard to beat for the price ($23-$27).